Akt, better known as protein kinase B (PKB), is a serine/threonine-specific protein kinase which acts as mediator via PI3K/Akt pathway in many biological processes like glucose metabolism, apoptosis, cell differentiation and transcription. Akt1 gene amplification has been implicated in gastric carcinoma while Akt2 amplification has been linked with ovarian, pancreas, breast and stomach tumors. The use of Akt inhibitors as monotherapy or in combination with other anticancer drugs could be useful for combating drug resistance and improving response. 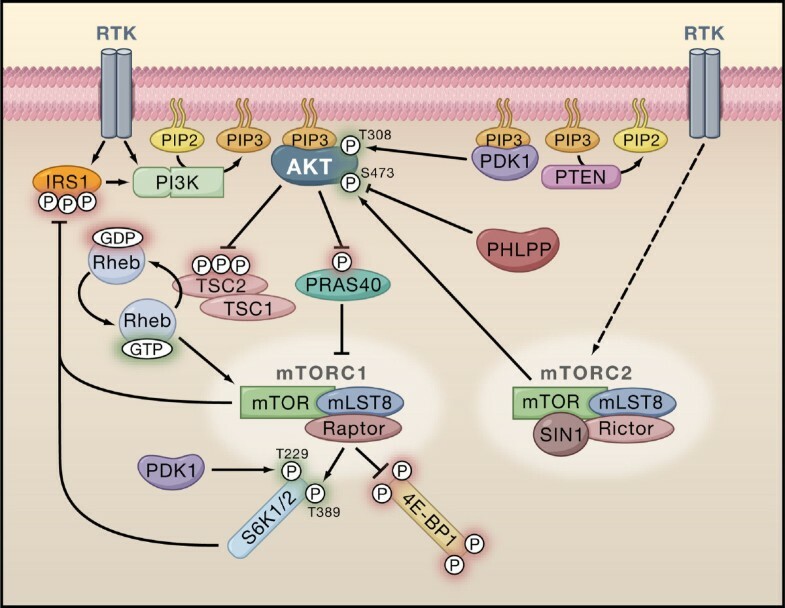 Thus, comprehensive understanding of Akt and its linked signaling pathways (PI3K, PKB, mTOR etc.) is necessary to lead to newer drug development and use. Akt, better known as protein kinase B (PKB), is a serine/threonine-specific protein kinase which acts as mediator in many biological processes like glucose metabolism, apoptosis, cell differentiation and transcription. Three members in the Akt family have been identified until now, namely Akt1, Akt2 and Akt3. While Akt2 is mostly involved in glucose transport and Akt3 is highly expressed in brain tissue, Akt1 plays a key role cellular survival and metabolism[1, 2]. The Akt cascade is activated by a host of events, most commonly via binding of ligands such as growth factors, cytokines and hormones to various receptors, the most important of which are receptor tyrosine kinases (RTK) (Figure 1). Binding of ligands to RTK causes autophosphorylation of tyrosine residues on the intracellular domain of the receptor. This causes the recruitment of PI3K to the phosphotyrosine residues via SH2 domain adapters in the regulatory domain (p85) of PI3K. This causes conformational changes in the catalytic domain of PI3K, which in turn results in kinase activation. This is followed by the PI3K mediated phosphorylation of membrane bound PIP2 to generate PIP3. PIP3 then binds to the PH domain of Akt, thereby anchoring it to the plasma membrane and allowing its phosphorylation and activation by PDK1. The activity of Akt is negatively regulated by PTEN, SHIP and CTMP. 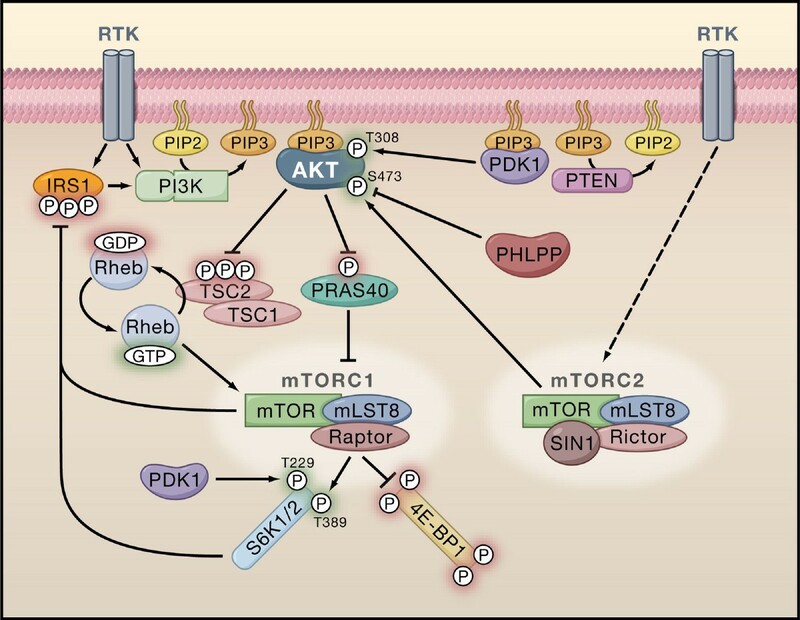 The PI3K/Akt/mTOR signaling pathway []. The mechanisms of involvement of the Akt pathway in tumorigenesis are multifold. Activated Akt has well- established anti-apoptotic activities. These are carried via inhibition of release of cytochrome c from the mitochondria or by its regulatory effect on various downstream effectors, e.g. NF-κB, Bcl-2 family proteins, FOXO transcription factors and MDM2, which in turn stimulate tissue growth[5, 6]. In addition, Akt activation mediates cell cycle progression via inhibition of glycogen synthase kinase 3beta, opposing the action of p21WAF1 and p27Kip1 and by phosphorylation of AKT/mTOR kinases. The latter results in increased translation of cyclin D1, D3, and E transcripts and carries special significance with regard to anti-cancer therapeutics. mTOR inhibition by rapamycin derivative, everolimus, has been shown by Majumder et al. to reverse AKT-dependent prostate intraepithelial neoplasia. The Akt signaling pathway also influences other facets of tumorigenesis. For example, Akt stimulates angiogenesis facilitating tumor growth. This is due to the mediation of the effects of VEGF by the Flk1/VEGFR2-PI3K-AKT pathway. Other hallmarks of malignancy such as tumor invasion and metastasis are also affected by Akt activation. This is due to the increased secretion of matrix metalloproteinases and the induction of epithelial–mesenchymal transition. Akt has also been shown to stimulate telomerase activity and replication. The spectrum of mutations leading to Akt activation is diverse and mostly affects the PI3K/Akt/mTOR pathway (Table 1). Amplication and overexpression of Akt2 was first shown to occur in ovarian cancers. Since then, overexpression of Akt2 has been shown to occur in pancreatic cancers, hepatocellular carcinomas, colorectal cancers, stomach cancers and various forms of breast cancers[16–19]. On the other hand, amplification of Akt1 is relatively uncommon, and has been detected in only a few cases of gastric carcinoma and gliosarcoma[20, 21]. Expression of Akt3 mRNA has also been found to be upregulated in estrogen receptor-negative breast carcinomas. Furthermore, Akt has also been found as a culprit for tumor cell resistance to chemotherapy while treating breast cancer, ovarian cancer and pancreatic cancer[16, 23]. A mutation in the Akt1 gene is also known to cause the Proteus Syndrome. Akt1, measured by immunohistochemistry techniques, has been shown to be a marker of response to radiation therapy in head and neck cancers. A plethora of Akt inhibitors is under pre-clinical and clinical trials. Various drug trials have been initiated for Akt Inhibitors. However, miltefosine, is the only Akt inhibitor which has recently got approved by FDA albeit for use in treatment of leishmaniasis. Akt inhibitors can be divided into six major classes based on their mechanisms of action. The first class contains ATP competitive inhibitors of Akt. These include compounds such as CCT128930 and GDC-0068, which inhibit Akt2 and Akt1, respectively[26, 27]. The latter has successfully entered Phase II trials. This category also includes the pan-Akt kinase inhibitors such as GSK2110183 (afuresertib), which has entered Phase II trials, GSK690693, which entered Phase I trials for refractory hematologic malignancies, but was withdrawn prior to enrolment, and AT7867, which is still in pre-clinical phase[28–30]. The second class contains lipid-based Akt inhibitors which act by preventing the generation of PIP3 by PI3K. This mechanism is utilized by phosphatidylinositol analogs such as Calbiochem Akt Inhibitors I, II and III (category no. 124005, 124008, 124009 respectively) or other PI3K inhibitors such as PX-866. This category also includes compounds such as Perifosine that entered phase III trials for colorectal cancer and multiple myeloma, but failed in 2012. The third class contains a group of compounds called psuedosubstrate inhibitors. These include compounds such as AKTide-2 T and FOXO3 hybrid[33, 34]. The fourth class consists of allosteric inhibitors of AKT kinase domain, and include compounds such as MK2206. The fifth class consists of antibodies and include entities such as GST-anti-Akt1-MTS. The last class comprises of compounds that interact with the PH domain of Akt, and include compounds such as Triciribine and PX-316. Apart from these, other molecules such as the Akt-1 Antisense Oligonucleotide RX-0201, have also yielded favorable results. In short, the use of Akt inhibitors as monotherapy or in combination with other anticancer drugs could be useful for combating drug resistance and improving response. Thus, comprehensive understanding of Akt and its linked signaling pathways (PI3K, PKB, mTOR etc.) is necessary to lead to newer drug development and use. The authors declare that that have no competing interests. AS conceived the topic. JB was involved in drafting the initial manuscript. AS and AKN were involved in critically revising the manuscript, listed in decreasing order of their contributions. The authors have read and approved the manuscript. The authors did not receive any financial support/grant.